An all-star cast and jazzy score highlight this charming comedy, a deft satire of classic caper films like Rififi. 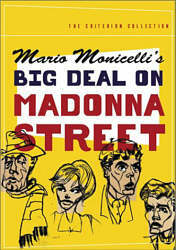 Big Deal On Madonna Street hilariously details the plight of a sad-sack group of bumbling thieves and their desperate attempts to pull off the perfect heist. DVD: Fullscreen 1.33:1; audio Italian Monaural; subtitles English; closed-captioned; single sided - double layered; Not Rated; 106 min. ; $29/95; 6/5/01. Ever since this site started to do pretty well, I’ve been the happy recipient of many, many free DVDs. Obviously this is a pleasant situation, as I almost never actually buy the things anymore; they arrive on my doorstep at no cost to myself. While I wouldn’t trade that situation, it isn’t always the paradise it may seem to be. With the good, I have to take the bad, and boy do I get a lot of bad! For the most part, I pick and choose which DVDs I want to review, but I still get a lot of stuff that I wouldn’t have pursued on my own. Much of this material comes from the auspices of the good folks behind the Criterion Collection. They’ve been well-regarded by videophiles for quite some time, so one might assume that their imprimatur marks a “seal of quality”. Unfortunately, that hasn’t meant that I’ve enjoyed every flick of theirs that I’ve seen. Of the 38 Criterion DVDs I’ve reviewed, 13 of them were movies I’d never heard of prior to their Criterion release. An additional 10 were films that I knew of but had never actually seen before the DVDs arrived on my door. These “unknown quantities” have been a decidedly mixed bag. For every pleasant surprise like The Element of Crime or Autumn Sonata, there’s a dud like …And God Created Woman or Variety Lights. My last such encounter with a Criterion DVD came via their release of Rififi, and this was another relative winner; the French caper flick was interesting and well-executed. Since Big Deal On Madonna Street took some inspiration from Rififi, I was curious to give it a look. Indeed, the 1958 Italian film has clear roots in the earlier French work, as both tell of a small gang that tries to net their one big score. However, Madonna Street offers a very different perspective as it goes down a much more comedic avenue. At the start of the film, Cosimo (Memmo Carotenuto) gets pinched while he tries to steal a car. Even though it’ll be a short sentence, he desperately wants out of jail because he’s concocted a major heist. As such, his compatriot Capannelle (Carlo Pisacane) scours the town to find someone to take the rap for Cosimo. Even with a payday of 100,000 lira, he has trouble getting a person to sit in jail for a few months, but eventually glass-jawed boxer Peppe (Vittorio Gassman) agrees to the gig. Unfortunately, things don’t work out as planned. Although Peppe “confesses” to the crime, the cops simply put both of the guys in jail. Through a ruse, however, Peppe gets the details of the prospective crime from Cosimo, and when he quickly leaves the hoosegow, he attempts to round up the gang and get the heist in action. Unlike the slick crew found in Rififi, these guys are lunkheads, and everything about their operation is second-rate. They try to get their act together, but inevitably all of their best-laid plans go awry, usually with humorous results. It’s not a question of if there’ll be a problem; it’s a question of what will the problem be. For a variety of reasons, sometimes it can be difficult to translate comedies to different countries, and when time factors into the equation, the problem becomes even more severe. However, Madonna Street makes a nice move across the Atlantic and the years. I don’t doubt that I missed some of the film’s charm due to distance - both time and miles - but I still got quite a lot of fun out of it. At first, however, I thought the movie would be a disaster. Based on the first few scenes, it looked like Madonna Street would be an excessively broad and bawdy affair, and I had low expectations for the rest of the piece. Some of the early shots are played with such hamhanded gusto that I thought I was watching bad outtakes from a Mama Celeste commercial. Happily, the movie soon settles into a groove, and it provides a fair amount of fun. I won’t go overboard and call Madonna Street a comedic classic, but it neatly lampoons the film noir genre without becoming overly nasty or stupid. Much of the humor plays on a fairly subtle level, and those were the best parts. We find one of the goofiest car chases ever committed to film, and the presentation of Tiberio’s (Marcello Mastroianni) surveillance footage was genuinely hilarious due to some mix-ups. Overall, I thought Big Deal On Madonna Street was a charming and entertaining little flick. This isn’t something that I’ll rave about forever, and frankly, it’s hard to generate much to say about it. It’s a rather unassuming piece that amused me for a period and that was that. Nonetheless, that’s good enough for me, as I thought Madonna Street provided a fairly winning experience. Big Deal On Madonna Street appears in an aspect ratio of 1.33:1 on this single-sided, double-layered DVD; due to those dimensions, the image has not been enhanced for 16X9 televisions. The picture presented a mix of strengths and weaknesses, all of which added up to a watchable but erratic image. Sharpness seemed good, though this came with a price. Throughout the movie, the picture always appeared very crisp and detailed, and I never detected any signs of softness. However, the image may have been too sharp, as it offered an excessive amount of moiré effects and jagged edges. I saw these concerns frequently during the film, especially in regard to the moiré. Clothes, blinds, stairs - pretty much anything that could shimmer did. This could become rather distracting at times, and it was my major complaint about the image. Print flaws also caused a number of concerns, though they were a less consistent problem. During much of the film, I saw a variety of defects, but white speckles were the biggest issue. These cropped up quite often and could be a mild nuisance. Light grain was visible through much of the movie as well, and other flaws appeared at times. I witnessed scratches, grit, nicks, blotches, and thin vertical lines at times. Parts of the film lacked significant defects, but at times these problems could become fairly heavy. Black levels always seemed very strong. The black and white image displayed fine depth and very positive contrast at all times, and I thought that it presented a very solid silvery appearance. Shadow detail also seemed generally good. A few scenes - such as the one in the locker room prior to the boxing match - seemed a little thick, but as a whole, the low-light sequences were appropriately clear and visible. Ultimately, Madonna Street looked decent for an older movie. Its strengths moderately negated its weaknesses, so it earned an overall “C” grade for picture. Less positive was the film’s monaural soundtrack. I thought this was a very odd track for a number of reasons. Among the problems that didn’t seem shocking were some quality issues. As a whole, this mix displayed a rather shrill and harsh tone. Dialogue appeared to be rough and edgy throughout much of the movie, and the music consistently sounded grating and excessively bright. Effects played a smaller role in the mix, but these also came across as rather strident and trebly. The mix lacked much dynamic range and failed to show many signs of depth. At times I heard very mild background noise as well. Since Madonna Street was made more than 40 years ago, many of these problems weren’t very surprising. I don’t expect a lot from older monaural tracks, and it’s not unusual for them to appear rough around the edges. However, Madonna Street sounded edgier than most, and it also displayed some other concerns. Many of the lines appeared to have been poorly-looped, and the lip movements often did not match the speech. I don’t speak Italian, and that made me believe that the synchronization was really off at times; if I can tell that the lines don’t fit the action so easily when I don’t understand the language, this problem would seem especially obvious to someone who could comprehend the words. As a whole, I found this mix to come across as a slap-dash affair. In addition to the poor integration of speech, it presented some other strange aspects. Many elements don’t fit in well with their surroundings. For example, in one scene Tiberio went into a side room to get his crying baby. The camera didn’t accompany him on this trip; it remained in the front room until he and the child returned. The baby cried throughout this sequence, but there was no change in volume when the kid moved from one room to another. The wailing should have gone up in level, but it stayed exactly the same. This may seem like a minor issue, but I thought it was very distracting; it took me out of the scene because the realism failed so badly. As I stated earlier, I don’t have high standards for older monaural tracks, but even with that in mind, I thought the audio for Madonna Street was weak. Also substandard was the roster of supplements found on the DVD. All we got were the movie’s original American trailer plus a short and modestly interesting essay from film historian Bruce Eder; the latter appeared in the package’s booklet. The lack of a commentary seemed to be especially disappointing in this case; I’d like to hear more about the ways in which Madonna Street came about and how it reflected other films of the era. By the way, am I the only one who thinks the cover drawing of Claudia Cardinale makes it look like she has an excess of facial hair? Despite the absence of supplements, Big Deal On Madonna Street still merits a look for fans of the genre. No, I can’t state that something like this will have very broad appeal, but I think folks who like film noirs will get a kick out of it. I thought it was a generally witty and entertaining piece. The DVD offers adequate picture with problematic sound and almost no extras. I can’t recommend a purchase of the disc, but the movie’s interesting enough that it warrants a rental for anyone who thinks it might be their cup of tea.